Hand Lettering for Kids Book! I’m so excited to tell you about the newest book by my friend Amy Latta of Amy Latta Creations! Amy Latta’s first book, Hand Lettering for Relaxation, has been a huge success! I had so much fun going through it and I learned so much! My hand lettering is still not perfect but I have gotten so much better. Amy’s newest book is designed just for kids or teens! It’s full of completely doable lessens and really cute doodles and sketches too. 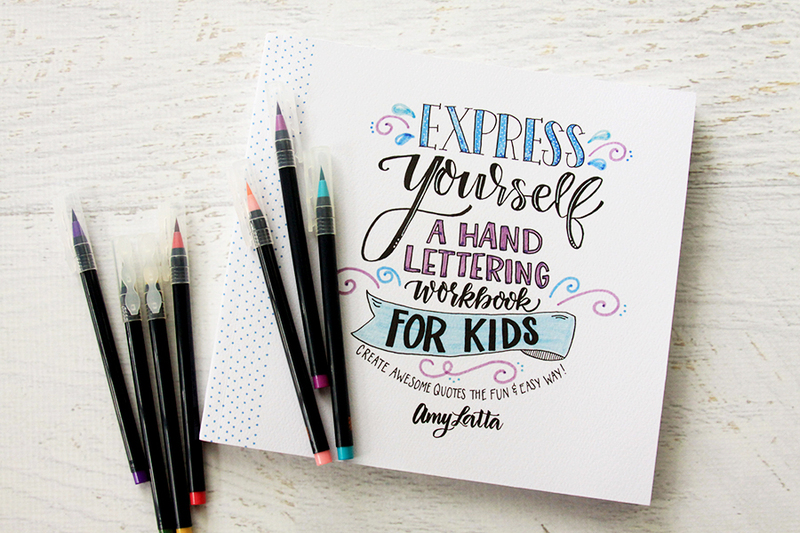 So kids can learn to create fun hand-lettered designs and embellishments. 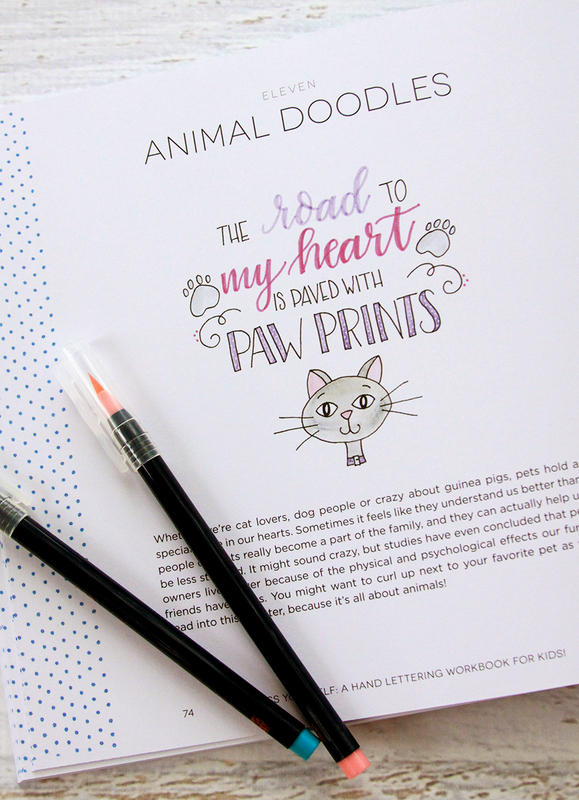 There are even cute workbook pages in the book so they can practice! 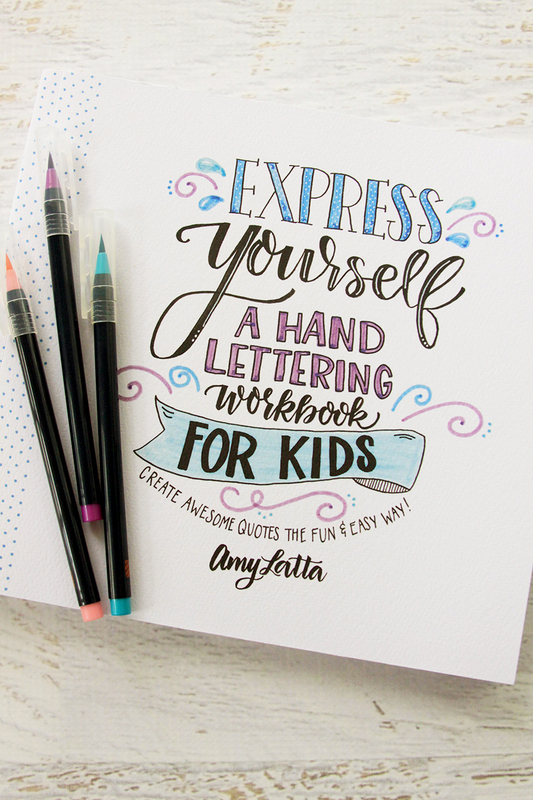 Amy teaches how to hand letter and create fun quotes, along with cute designs that are easy to recreate. This book is perfect for the gifts and the holidays too! You can pair the book with a great set of markets for the perfect present. Amy even has a list of recommended supplies in the book to make it super easy for you! I’m having a giveaway for a copy of Express Yourself! To enter to win, leave a comment below with who you’d give the book to! This would be perfect for my niece! She loves to draw and write inspirational quotes in her journal. My granddaughter is very creative…I would love to see what she would be able to do with this. What a great book! I would give it to my sweet niece who loves to draw. I want it for me. Love the idea of drawing and writing to great-grandchildren!! My great-niece loves to draw and letter. This would be perfect for her. And, I’d get one for me also so we could work on it together. I have 9 grandchildren and I know at least 4 of them would love this book! I would give this to my niece who is showing great artistic promise! I’m not biased either, lol. Thanks for the chance. My son would love this book! I’d give this to my 9 year old daughter. She has recently started to experiment with hand lettering and this would be a fun gift. Thanks for doing a giveaway! I think my grandniece would love this book. Who I’d give it to…..um…..I need it….been wanting to learn this for a long time so figured the kid version would be an easy start even though I’m 63. This would be so much fun for my creative niece! Our 8 year old granddaughter would love this! I keep spiral drawing paper tablets here and when she comes over, we draw together. Cherished memories of our time spent together! I would gift this book to my sweet (almost) 16 daughter! She loves to draw, doodle and daydream! I would give this to my granddaughter! I would give this to my daughter. She is almost 12 and loves art and is learning about calligraphy at school. I would keep it for myself! Both of my girls would love this book. Then they could be like mom! I’d actually like to have it myself. A kids version is just what I need. lol. I would definitely give it to my daughter – she would love this book! I would give this to my artistically creative almost twelve year old granddaughter. My daughter will be 10 in a few months – this would be perfect for her! This would make a perfect gift for my 10 yr old daughter. Nice to be able to stay away from electronics. If I win I’ll give this book to my seven year old granddaughter Sophia who loves to draw. I would give the book to my creative and artsy teen daughter. I would give this to my niece. What a great giveaway! I’m going to get this book for my daughter, it’s perfect! I’d give it to my friend’s daughter. MY Grand daughter Helen. She loves to draw & write & doodle. Would love this for my niece! I would love this for my grandsons. They are 6 and 9 and love to draw, make cards, games, whatever they can think of. I have bought pads of paper for drawing and colored pencils for the last 2 1/2 years for birthdays and holidays and they are always very excited to receive them. The older one has even written a couple of books for school, and I think he would be able to put this to good use. Thanks. I’d have to buy an additional one so I could give one to each of my grandaughters to get them started on this fun hobby. I’d like to give it to my son – he loves trying all kinds of artsy techniques. 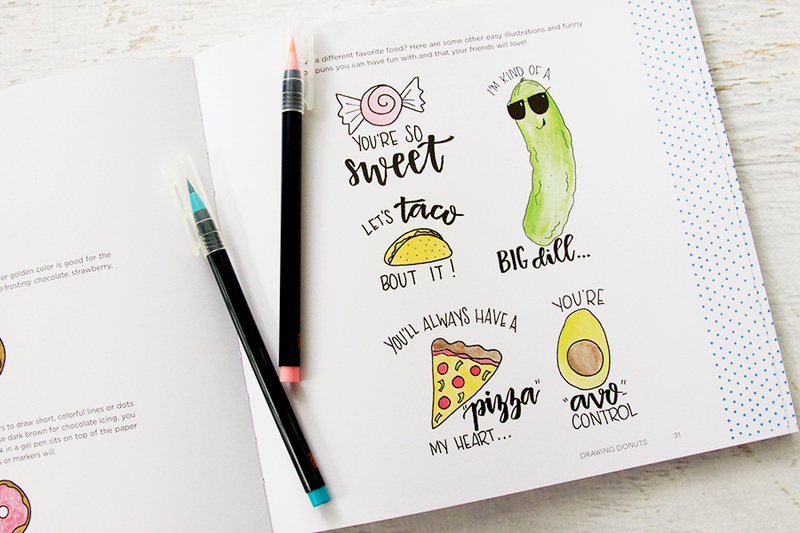 He’d love those food doodles and punny phrases! What a helpful book! My daughter would love this! Thanks for sharing. I love creative writing and would be hard pressed to give it away..I think I would be so tempted to deep it.I love learning new stuff. I would give it to my granddaughter — she loves to draw, color and sketch. I would love to give this to my granddaughter. She would enjoy it! A Perfect Gift for one of my granddaughters for Christmas!! My grandson is our artist – he would love this book. I’d love to give this book to my daughter. Thank you! My daughter. She would love this. My daughter, she would love it! I’d love to gift this book to my granddaughter who just loves art! I would love to have this book for my daughter Kaylin! This looks like a great book even for adults who have a really hard time with learning to letter (raising my hand here!). My granddaughter, she is very creative and loves doing crafts. I would like it for myself but would definitely share it with my daughter! I would keep the book in my classroom at a Shelter for kids waiting to go to a foster home. My youngest grandson would like this book. My daughter would love this, she and another gal get together to make hand lettered birthday presents. My granddaughter is very artistic and loves to create! She always makes a card for everyone for special occasions. This would be perfect for her! I know I’m a day late, but just got your email about the contest today. I have a great nephew who would appreciate this. my grand daughter would love this….I might too! My son and daughter are 15 and 14. Both LOVE drawing and lettering. They have been getting in trouble at school, unfortunately, and I am considering home schooling them. This book would be a wonderful break time art activity between their online lessons. Thank you for the give-away! This would be perfect for my mom. She has arthritis in her hands and is truly lamenting the loss of the beautiful penmanship she had. She is of the “letter writing” generation so writing, penmanship is very important to her. I think this would be perfect to lift her spirits, exercise her hands and restore her confidence in writing again. I would give this book to my grandson. He just turned 9, and he L O V E S to write stories and illustrate them. He is ALWAYS drawing, and I can only imagine how excited he would be to have a book like this. And, of course, this Mamaw would provide him with lots of markers and pens to experiment with. Thanks for the excitement of thinking we could become your winners for this book! My Grand Daughter would love this book! I would use this as a prize someone in my Sunday school class could win. My nephew or my (younger) sister, not sure which. I think this would be fun for both my daughter and myself! I would give it to my youngest son who is so creative and uniquely himself no matter what others are doing he does him. I think this would be great for my brother he just had a stroke and needs to relearn writing and reading. I would love to have this for me. It is something I’ve always wanted to try. My name is Bev - thanks for stopping by Flamingo Toes! I'm a Tennessee transplant that loves to make all kinds of things - sewing, embroidery, jewelry, diy and whatever else sounds fun. The latest posts - emailed right to you!